Home » Publications » Briefing Papers & Op-Eds » Adalah's Position Paper on "Prawer II"
Toward the end of 2016, Israeli Minister of Agriculture Uri Ariel declared his intention to promote an amended version of the "Prawer Plan," frozen in 2013, in the near future. After reviewing the new plan - Memorandum of Law on the Regulation of Bedouin Settlement in the Negev (Naqab), which we will refer to as "Prawer II" - Adalah has concluded that there are no substantial changes in the concept or the aims of the plan, or in the means specified to implement it on the ground. The fundamental aim of the plan is still to dispossess and forcibly displace c. 80,000-90,000 Palestinian Arab Bedouin citizens of Israel from around 36 villages, which are unrecognized by the state, to a segregated, concentrated area in the northern Naqab. The government's plan is still based on false information that has long-dictated Israeli policy towards its Bedouin citizens: first that the Bedouin community is trespassing on "state land" and their very presence there is "illegal"; and second, that the Bedouin have no legal claim to their ancestral land in the Naqab and any final settlement on Bedouin land claims should be resolved in favor of the state. Despite strong and consistent international criticism of the original Prawer Plan, the Prawer II Plan outlines an almost identical framework process to expedite procedures to demolish the unrecognized villages, and to dispossess and forcibly displace Bedouin citizens of Israel living in the Naqab. Since the new version of the Prawer Plan is almost identical to its predecessor, with only a small number of minor differences separating them (see table, below), all the criticisms that were levelled at the original plan also apply to Prawer II. The United Nations and the European Parliament both criticized the original Prawer Plan and called for its cancellation. For example, the UN Committee on the Elimination of Racial Discrimination (CERD) urged the Israeli government to withdraw the Prawer Plan on the grounds that it was "discriminatory" and would "legalize the ongoing policy of home demolitions and forced displacement of the indigenous Bedouin communities" (Concluding Observations on Israel, 9 March 2012, #20). The European Parliament called for "the protection of the Bedouin communities of the West Bank and in the Negev, and for their rights to be fully respected by the Israeli authorities, and condemns any violations (e.g. house demolitions, forced displacements, public service limitations); calls also, in this context, for the withdrawal of the Prawer Plan by the Israeli Government" (European Parliament Resolution of 5 July 2012 on EU policy on the West Bank and East Jerusalem). In a report released in February 2014, the U.S. State Department called the treatment of the Bedouin one of Israel's "most significant human rights problems", adding that "the Bedouin segment of the Arab population continued to be the most disadvantaged." The report further noted that many Bedouin had complained that being relocated to government-planned towns would require them "to give up claims to land they had occupied for several generations and would separate them from their livelihood" (U.S. State Dept., 2013 Country Reports on Human Rights Practices, 27 February 2014). This short paper provides a summary of the plan and Adalah's main points of criticism. It also provides a table comparing numerous aspects of the original Prawer Plan – 2013, with the new version of the plan. Lastly, it provides a map of the very limited area in which the Israeli government seeks to concentrate the Bedouin living in the Naqab. 1.The plan envisions the mass evacuation and destruction of the unrecognized villages. It considers no other potential options that have been embraced and promoted by the Bedouin community itself, first and foremost granting recognition to the unrecognized villages and allowing their inhabitants to remain on their land, with respect for their land and property rights on an equal basis with Jewish Israeli citizens living in the Naqab. 2.The plan denies Bedouin land ownership rights, and thus the extremely limited provision of compensation in land and money is insufficient, inadequate and unacceptable. 3.The plan violates Bedouin citizens' constitutional protections and denies them access to regular procedures of administrative law. It instead grants wide-ranging, sweeping administrative powers to the state authorities, comparable to emergency laws declared during wartime. Cease the government's policy of home demolitions, evictions, and indirect methods of forced displacement, including the denial of access to basic services, education, health and water, against Bedouin residents of the unrecognized villages. Partial compensation in the form of land and/or money: Compensation in the form of land is conditioned for eligible claimants – a very minimal number of persons who meet the overly-restrictive and arbitrary conditions and criteria imposed by the state, including the requirement that they submitted a land claim between 2 May 1971 and 24 October 1979 (the only exception to this rule is if the claimant is the State of Israel, the Jewish National Fund, or the Development Authority) – upon proof of cultivation/residential use of the land at the time of the original claim. If a court has previously denied land title the claimant is ineligible for compensation. The evidence used in proving cultivation/residential use of the land is confined exclusively to the evidence that the state itself brings, in the form of aerial footage and an expert opinion furnished by a consultant to the compensation committee. The Bedouin claimants may not furnish their own evidence (such as Ottoman and British tax records, archaeological and anthropological evidence such as wells, cemeteries, oral history etc.) to support their claims. All compensation is conditioned, among other things, on: the claimant moving to one of the recognized residential areas demarcated for the Bedouin (e.g., government-planned townships), and on the claimant's agreement to waive his/her land rights and to the allocation of his/her claimed land to others. Monetary compensation, although higher than the level cited in the original Prawer Plan, remains far below market levels. Partial compensation in the form of a percentage of the original parcel of land is allowed only in an area identified on a map provided (appendix 1 to the plan; see below). Partial compensation in land for residential use is allowed only in a recognized Bedouin town located in the area identified on the map (appendix 1 to the plan; see below). Administrative eviction orders (as opposed to regular eviction lawsuits filed in court). No prior hearing is allowed. The courts are stripped of their powers of judicial review with regard to eviction orders. Judicial review is limited only to technicalities. Anyone who does not cooperate or anyone who does cooperate but fails to fulfill all conditions set out by the authorities based on the plan can be issued with an eviction order. "Reasonable force" can be used for enforcement with police assistance. Possible criminal charges and up to two years' imprisonment may result from failure to comply with an eviction order. A Bedouin resident who is not a land-ownership claimant and fulfills the conditions of the law will be offered a residential plot only in a recognized Bedouin town in the area identified on the map (appendix 1 to the plan). A basic assumption of the Prawer II Plan is that the 80,000-90,000 Bedouin residents of the 36 unrecognized villages are illegal squatters who have no rights to the land. It then states that the Bedouin population should be concentrated in recognized areas through forced displacement and evacuation and the demolition of the unrecognized villages, in violation of the residents' rights to property, dignity, equality and due process. The forced eviction and concentration of the Bedouin community were established as central pillars of the government's policy towards them during the military regime period (1948-1966) that followed the founding of the State of Israel. It sought to strictly restrict their living area to a limited geographical area known as the "Siyag", closely monitor and control them, and force them to abandon their traditional way of life, culture and their traditional economy based on cattle-rearing and farming. The ultimate aim of this policy was to empty large areas of the Naqab of its Bedouin inhabitants in order to use it to build and expand Jewish towns and villages in their stead. It was largely effective: as a result of state policy, Arab Bedouin residents were expelled from 95% of the Naqab outside the Siyag area during this period. The Prawer II Plan is intended to deal with the remainder of the Bedouin who continue to live in the unrecognized villages and their descendants. It presents evacuation as the only option for the Bedouin residents of the unrecognized villages. It considers no other potential options that have been embraced and promoted by the Bedouin community itself, first and foremost granting recognition to the unrecognized villages and allowing their inhabitants to remain on their land, with respect for their land and property rights on an equal basis with Jewish Israeli citizens. 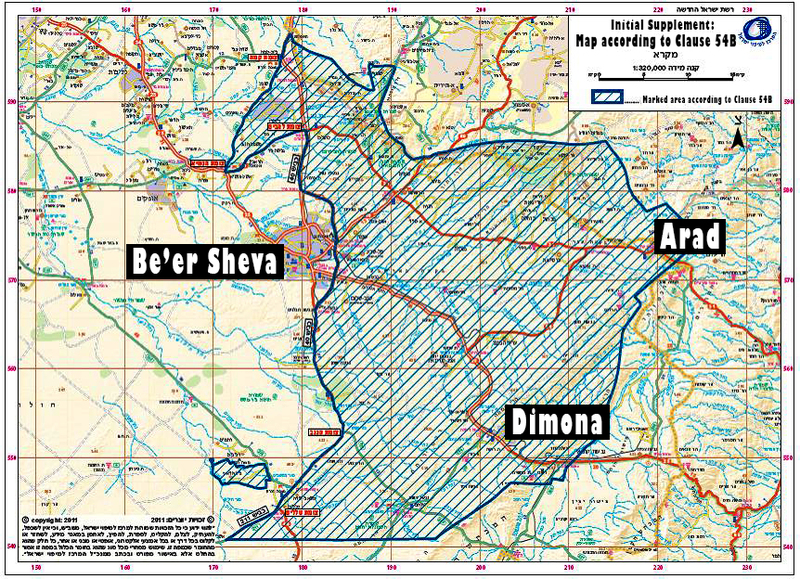 The premise underlying the Prawer II Plan is that Bedouin land ownership in the Naqab is non-existent. The "settlement" it proposes for the Bedouin is therefore ex gratia, offered supposedly as a show of "good will" on the part of the state rather than on the basis of any legal requirement. The provision of compensation in land and money is grounded in the complete rejection of the Bedouin's land ownership and property rights, and of their historical connection to their ancestral land. In adopting the proposed "settlement", the state has acted in bad faith to deliberately ignore clear, proven facts regarding historical, traditional Bedouin ownership of land in the Naqab land, and the objective reasons why the majority of it was not registered in the Israeli Land Registry in the 1970s. The Prawer II Plan strips the Bedouin residents of the unrecognized villages of constitutional law protections and denies them access to regular procedures of administrative law. It instead grants state authorities' wide-ranging, sweeping administrative powers, comparable to emergency laws declared during wartime. This legal framework contradicts the principle of equality for all before the law, violates the basic constitutional right to due process, and undermines the rule of law itself. Under the plan, Bedouin residents of the unrecognized villages – many of which have existed for centuries, while others were built decades ago at the orders of the Israeli Military Governor – will be evacuated by administrative order that will leave them ineligible to claim any ownership or usage rights to the land they live on. Nor will they have the opportunity to challenge the decision to evict them or defend their rights by recourse to administrative or constitutional law, or to defend themselves against the destruction of their homes based on the "equitable defense" doctrine. Indeed, the plan creates a totally separate legal mechanism that applies specifically and exclusively to the Bedouin in the unrecognized villages, that lies completely outside the laws and regulations that apply to all other areas under state control and to all other citizens of Israel. In segregating the Bedouin in the unrecognized villages in the Naqab from all other citizens to deny them the equal applicability of the law, the plan draws on sweeping generalizations about the Bedouin that have no basis in fact, and relates to them as a single, homogenous group. Prawer II, like its predecessor, lacks any examination of the specific conditions of any of the unrecognized villages and promotes the principle of segregation based on ethnic belonging, demarcating specific and restricted areas for residence by the Bedouin community and for any partial compensation in land they may receive in advance of the process. A map of these areas appeared in the first addendum to the plan, and is also presented at the end of this paper. The resolution of Bedouin land settlement in accordance with government decisions; the regulation of Bedouin land ownership claims; and the development of the Naqab (Negev). Exclusively to the Bedouin and to a specific geographical area (the Naqab). The concentration of the Bedouin community into existing government-planned townships designated specifically for them. Does not mention any recognition processes. Who is an eligible claimant? Eligible claimants are limited to persons who submitted a land claim between 2 May 1971 and 24 October 1979. The only exception is if the claimant is the State of Israel, the Jewish National Fund, or the Development Authority. Land and/or monetary compensation. Compensation in the form of land is conditioned for eligible claimants upon proof (limited to proof provided by the government only) of cultivation/residential use at the time of the original claim. Land compensation same as Prawer 2013. Monetary compensation has been increased but remains far below market levels. The claimant moving to one of the recognized residential areas. The claimant's agreement to the allocation of his/her claimed land to others. A Bedouin resident who is not a land-ownership claimant and fulfils the conditions of the law will be offered a residential plot only in a recognized Bedouin town in the area identified on the map (appendix 1 to the plan). What if the land title claims are pending in court? If the claimant does not elect to participate in one of the frameworks of the law and the court decision is delivered after the end of the (unspecified) implementation period of the law, then his/her title will not be acknowledged even if the court granted him/her title. The claimant will, however, be entitled to compensation. Identified by a map (appendix 1 to the Prawer Plan Law – 2013). No compensation in the form of land is allowed outside the identified area. This area is small in relation to the needs of the Bedouin community and compared to the large land areas historically owned and used by the Bedouin in the Naqab. Only the state may provide evidence to prove actual possession of land (relevant for determining the kind and amount of compensation); the Bedouin claimant may not introduce any evidence in this regard. Administrative eviction orders (as opposed to regular eviction lawsuits filed in court); no hearing. Who will receive eviction orders? Anyone who does not cooperate with the plan and anyone who does cooperate but fails to fulfil all conditions set out by the authorities based on the plan. "Reasonable force," to be exercised with police assistance. Possible criminal charges and up to two years' imprisonment for failure to comply with an eviction order. Courts are stripped of powers of judicial review with regard to eviction orders. Judicial review is limited to technicalities only. The Minister has absolute discretion regarding the implementation and enforcement of the Plan. Identified by a map (appendix 1 to the Prawer Plan Law – 2013). No Bedouin settlement is permitted outside the recognized Bedouin towns in the identified area. For example, Prawer II imposes some additional limits on the option of compensation in land (for Bedouin citizens who stand to lose their ancestral land) compared with the original plan; it also increases the amount of monetary compensation offered in comparison with the original plan, while keeping it at levels that are far below the market value of the land and ensuring that minimal numbers of claimants qualify through overly-restrictive conditions and criteria.